One of the market leader in the data storage industry, Verbatim has released its new sleek Color Nano Wireless Notebook Mouse that compatible with Windows and Mac systems. Color Nano is bundled with a a nano receiver that small enough to leave connected to a laptop, utilizing 2.4GHz RF wireless technology for optimal result in cursor movements. According to Verbatim, the Color Nano Wireless Notebook Mouse features a smooth, rubberized grip that designed to provide comfort and control for right or left hand. 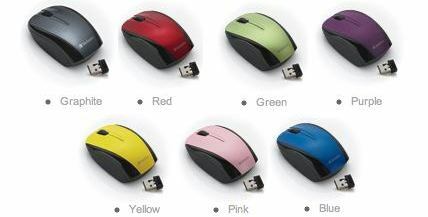 The new Verbatim Color Nano Wireless Mouse that offered in red, green, purple, yellow, pink, blue and graphite colors is now available for about $30.